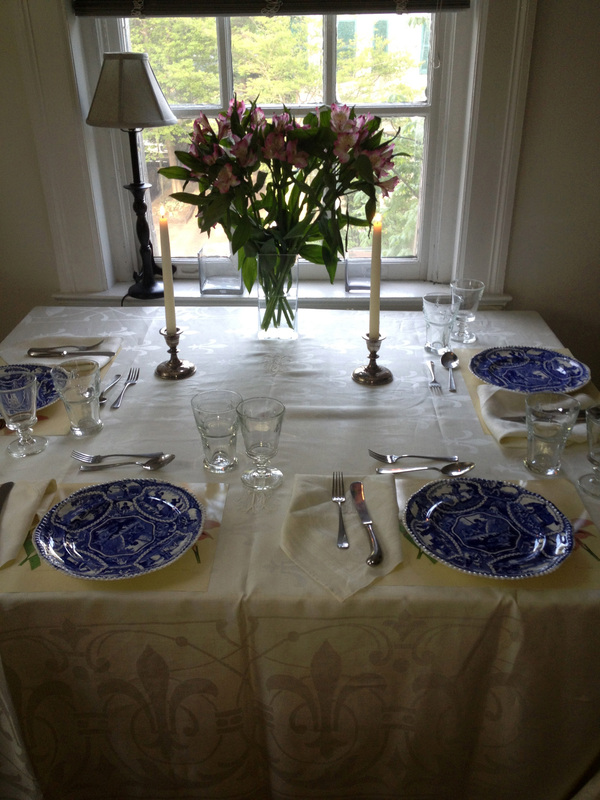 Last night, my brother and I collaborated on a long overdue birthday dinner for my dad and stepmother. We put on a spectacular party if I do say so myself – all very Discountess-friendly. We planned a menu that used a lot of the same ingredients, which helped make the grocery shopping more efficient and cut down on waste. I don’t know about you, but it really fries me when I have to buy a bunch of fresh herbs only to use one tablespoon and have the rest go bad. I felt totally vindicated when we conjured up this menu because it used up most of the ingredients we had to buy! We started with Ina Garten’s Tuscan Mashed Chickpeas on a toasted baguette. Not only was the recipe easy, but it used basic pantry items that I had on hand. For the main course, we had roasted salmon. Since it was the star of the meal, I didn’t scrimp on the cut of the fish. I headed to an old family favorite, Cannon’s Fish Market, in Georgetown. They gave me a center cut of an 8 lb fish (I only needed about 3) for $28.89. I roasted it with a bunch of dill, parsley, lemon and green onions in the center, finished off with some salt and pepper. I drizzled olive oil on the top, added thinly sliced lemons, and tossed it in the oven at 350 degrees for about 30 minutes. Doesn’t it look pretty? I made a “salsa verde” to go with the salmon that used up the rest of the fresh herbs. It was a sleeper hit! We rounded out the main course with a new potato salad and fresh asparagus. Wine was courtesy of my trip to California. And for dessert, individual strawberry shortcakes, recipe courtesy of Bisquick. All in all a lovely meal, and for my part, the total tally did not exceed $80 (which will eventually be split between the two of us). Not bad! For those who want it, I’m including the Salsa Verde recipe below. I highly recommend it! Easy and delicious. I don’t know how capers and mint go together, but trust me, THEY DO. Place the garlic, capers and fresh herbs in a blender. Add half the lemon juice and olive oil, and pulse a few times. Add more oil and lemon juice as needed to create a sturdy, herb-heavy sauce, and season to taste with salt and pepper. Serve with salmon. Can be made a day or two in advance. Lucky father and stepmother! Super dinner! Hmmm, I always put my salmon skin side down. Very interesting. Me too! But this was good. Definitely worth a try! Looks delicious! This is inspiring because I almost always feel my wallet hurting after making a nice dinner for friends and family. Also, glad that CA is representing w/ the wine!